For many years, when it comes to cars, Africa has largely been a consumer and never a producer. But recently, africa-facts.org, online portal, highlighted some cars that companies in different African countries are working on to answer common problems such as rough roads as well as limited power supply. Here, we highlight some of them. Automotive manufacturing in Africa is growing industry as lot of manufacturers move closer to their African customers and discover the advantages of low-labour costs and tax holidays. Demand for automobile spare parts in Africa growing on a faster rate. The automotive production industry in South Africa is nearly 100 years old. In the 1980s and 1990s, Nigeria achieved significant production and production occurs in Egypt and more recently Morocco. Smaller production activities take place in Kenya and some decades ago in Zimbabwe. but, currently significant modern assembly is located on the large in South Africa. Formed in 2015, the Africa Association of Automotive Manufacturers (AAAM) works specifically to promote and facilitate the growth of the African automotive industry. 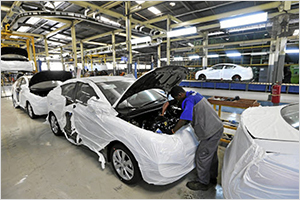 Formed by executives from the world’s biggest car manufacturers, the African Association of Automotive Manufacturers (AAAM) embarked on a concerted push to revive and resurrect Africa’s auto industry. Since then, the newly-created African Association of Automotive Manufacturers (AAAM) has been working with key African governments to create the right policy environment for the sector to Flourish. Africa’s unnoticed want combines with a slow growth in consumer spending which has been increasing at a yearly rate of 10% over past years. Moreover, analysts predict that by 2030, over half a billion Africans will have joined the middle class. “If the growth in vehicle sales keeps pace with growing consumer spending, annual sales of passenger cars in Sub-Saharan Africa will surpass 10 million units by 2030,” says South African consultancy B&M Analysts.